This is no joke, though being scheduled on April Fools' Day. Hikashu will perform with Third Person on April 1, 2013 at Star Pine's Cafe in Kichijoji, Tokyo. 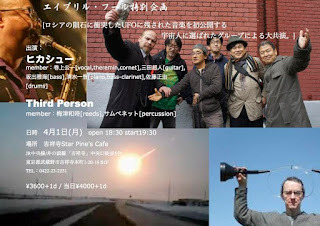 Third Person (wikipedia) is an improvising trio from New York City, formed by Tom Cora (cello) and Samm Bennett (percussion) in 1990. Their performance usually featured a guest - a third person. Guests included guitarist Marc Ribot, harpist Zeena Parkins, clarinet player Don Byron and saxophone players George Cartwright and Steve Lacy. Later saxophonist Umezu Kazutoki settled as "the third person," and the trio recorded two albums. They disbanded when Tom Cora passed away in 1998. In 2012, Umezu and Bennett revived Third Person out of the blue, and the group backed to the live circuit. At the April Fools' Day gig, Third Person will join Hikashu's set. Moreover, each member of Hikashu will be invited to Third Person's set as a guest. All the seasoned improvisers, playing together. Sounds incredible, to say the least. This is going to be a beautiful evening. Do not miss it. "The huge collaboration of the groups which are chosen by aliens - the premire performance of the music being found on the U.F.O. which collided with the meteorite landed in Russia"